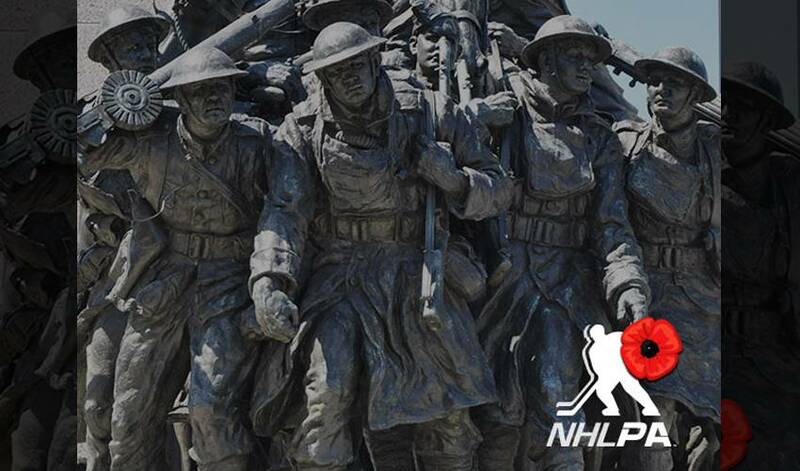 Defending the Blue Line just one example of how NHLPA members honour members of the military. On November 11, the date on which the men and women of the armed forces, past and present, are honoured for their sacrifice and bravery, Shane Hudella will be reminded of the widespread and passionate support that his Defending the Blue Line (DTBL) organization receives from NHL players. Hudella, who was on active duty for the Minnesota Army National Guard and was deployed for Operation Desert Storm in 1990, started DTBL in 2009. DTBL works to ensure that children of military members are afforded every opportunity to participate in the game of hockey, through free equipment for military kids, hockey camps, special events, and financial assistance for registration fees and other costs associated with hockey. The NHLPA’s Goals & Dreams (G&D) fund, the largest grassroots hockey assistance program of its kind in the world, has strong ties to DTBL. In 2013, G&D donated 50 sets of brand new hockey equipment to the military youth supported by DTBL. Over the last five years, G&D has donated 325 complete sets of gear to their campaigns, including 25 at an event in Minnesota last year. Numerous players have lent their time and assistance to various DTBL initiatives. For Hudella, that loyalty is appreciated, but certainly not unexpected. “What makes the hockey players so great? To me, it's that they are the ‘working class athletes.’ What I mean by that is that they worked hard to get where they are, and they haven't forgotten that. They are humble like our troops, and always have time for our heroes. I've witnessed a ton of the meet and greets personally, and it's so striking to me to see the athletes and the service members both looking and acting like they just met their hero. Devin Smith, Chairman, G&D, is proud to see the strong bond that’s been established between the players, the program and DTBL. Hudella knows he can always count on the players. “They are genuine in their caring and admiration of the heroes,” he said. “It doesn't matter if they had a bad game or a loss that night, they are always willing to take time with our troops to make sure they know how much they are appreciated. Additionally, as a whole, the players spend a tremendous amount of their precious down time helping us at various events.